Wait – What’s my name? A name. The first thing you’re given and the last thing remembered in life. Brown – Well, it’s a colour. But more on that later. Grace has been a big theme for me the past few months. Both because I have been learning the importance of extending grace to others but also about the amount of grace I have been given. Being ‘graceful’ is more than being smooth and ballerina-like. It’s a character trait. Famous Warrior. Now what does THAT even mean in these days? I am not exactly a warrior…on the outside anyways : ) In some circles, rumour has it that it means ‘woman of prayer’ or ‘prayer warrior’. That’s something else I’ve been learning this year. There is a battle going on, always; whether we acknowledge it or not. One way I can pick up my sword is to pray. And so I do. This is what I’m learning. Brown. A surname. Last names are rare in Mongolia. Don’t take yours for granted. It may seem straightforward, but there is more to this if you look. This name tells people who I am. I am a Brown. I belong to my family and they belong to me. Their stories are important, and are a part of who I am and how I came to be. I would not exist without them. My name is a part of my heritage. My name is a gift as well. You might know that my brothers and I have a different last name than my parents. You see, that is because my dad died when we were young. My Mom remarried, and that’s okay. I am the only daughter of my father, Daniel Brown, and my name is a part of my Dad that I can always keep. Anna Brown is more than something that sounds nice. He gave me his name. His identity. One day perhaps my last name might change, but I intend to live up to my name the best I can while I have it. It is an honour to carry. 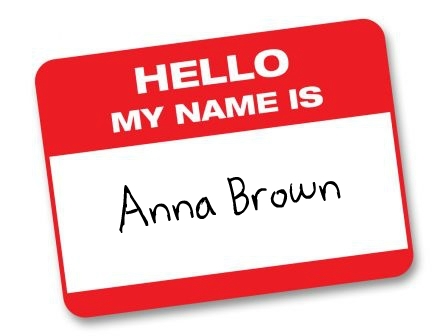 My name is Anna Brown. I am not Anna Anybody Else. Love all of you posts! So happy to have you as a cousin….learn lots through reading these! Stay warm out there! Great post once again. I think names are really important. Another important thing is that “He knows your name.” (and he’s seen your video). but that you’ll actually be given, by that King, a little white stone (once we get to our Other country) that has our true name on it, given by our heavenly Father. So cool! (Rev. something or other). Another weird thing is how similar our names are, Anna Brown. My name is also grace based. Anita, derivative of Ann, meaning ‘full of grace,’ and ‘Susan,’ graceful lily, and ‘Wiebe,’ mighty warrior! (and I have Brauns for great grandparents, which is Brown in English)! So I am an uber graceful brown tinted warrior lily. I knock people dead with my overly pungent aroma perhaps! ha ha. I also named my kids warrior or victory themes, Kyla Nicole is ‘a comely one, and victory of the people’ and Colson Stanley is ‘Victory of the people (in a ) stoney field.’ 😉 I’ve read an old Christian classic “Destined for the Throne,” and the writer is convinced that the bride of Christ will have to be trained properly in the job of partnering with her husband in his war and work before the marriage ceremony will ever take place. His take on this was exactly ‘prayer.’ That we come to the board-room with our partner, Jesus, and address the Father (the CEO) saying, your son, my fiance’ and I have agreed that such and such venture is in the best interests of your company, and we would appreciate resourcing for that venture. When we do this corporately,it is even more powerful (2 or 3 gathered at the table). I had never really thought of it in that light. But he made a point of ‘if we are a passive, uninteresting, uninvolved bride (not a helpmeet but a dishrag) then we aren’t ready for marriage. So come to board meetings, and get onto the battlefield Anna Brown! You were even named for it! Love your thoughts Nita! Thanks for taking the time to respond, my uber-graceful brown-tinted warrior lily! hmmmmm… this made me think. One of these days I need to deal with owning my first name. Until then thank you for the reminder. We took care in naming our children based on the meanings of their names and I pray that one day they understand why we gave them the names we did and take pride in them. I also like this notion that Nita (in the comment above) that Abba will let us know the name he has for us when we meet him… cool! Hugs. I’m reminded of the Fruits of the spirit Auntie – you’ve got the Spirit in you, all you have to do is claim the fruit! I like your kids names a lot and it’s cool that you were so intentional with the meanings. Thanks for the comment! Hi Anna, I’m not sure where the Louise came from but I believe your great grandma Brown was also named, Anna. Also, your name , Anna, is very special to Tim and I because you were born on our wedding day so to us, it is short for, anniversary. I was unaware of the gender confusion as a history in our family. Grandpma? M, you are too good to me. I’m glad SOMEBODY edits these things! Shanks for pickin’ up my slack, brother. Wow Anna, how I love to read your blogs, I feel like I’m sitting in a warm comfy chair reading “Anne of Green Gables”. I love to hear what God is doing in your life, what he is teaching you and challenging you to become. I agree that there is a lot to a name. But as I was reading your blog, I thought you not only have your Dad’s name that identifies you you also have your heavenly papa’s name that identifies you and you so must make him proud – I’m sure he smiles down and says, yes that’s my daughter, she’s got my name, and I’ve got hers engraved in the palm of my hand! Yeppers! I thought about that too. Identity is nothing without realizing where God is in the equation… I like the thought about the palm of his hand. Thanks Eva!